Extra protein for every meal. Small flake, big punch. Our Protein Flakes bring every meal up to an unprecedented protein level. Quick. Simple. And delicious. Perfect, if your goal is muscle building. Or your new bikini body. 100% plant-based protein for your muscles. Made from our unique fine flake soy. And of course: 100% organic. No genetic engineering or chemical additives. Nutritional information per 100 g Protein Flakes. Do you know how little protein you actually eat? Our Protein Flakes will change your life. You think that meeting your protein requirements is easy? Actually, it's not! That is because many foods actually contain much less protein than your muscles really need. You can change that. Our Protein Flakes contain 53% protein all on their own. That is quite incredible. That makes it really easy for you to add that extra kick of high-quality plant proteins to every meal. With our Protein Flakes you can hold out for longer. Fibre is largely indigestible. And that's what makes it good for you. Because when your body is busy digesting fibre, it has less time to think about cravings. 30 g of fibre per day is recommended. Not a thing you will have to worry about any more. With an amazing 21% fibre, our Protein Flakes are just what you want. You can’t get organic soy in Germany? Of course you can! Soy imported from Asia? No thanks. We know exactly where every sprout comes from. From the certified organic seeds to the finished fine flake soy. Completely natural and free from genetic engineering and chemical additives. Single origin – organic farm produce from Lake Constance. The nutritious soil and mild climate in the border region between Austria and Germany create perfect growing conditions for our sprouts. And how we get around it. Soy has a pretty bad reputation in some circles.... And we don’t think that’s justified! After all: not all soy is the same. We process our sprouts intelligently and without the use of chemicals. That way, we get the very best out of them. Crispy Chicken Crumbs: compared to crumbs without Protein Flakes/ Falafel: compared to the recipe without Protein Flakes/ Veggie Burger: compared to spelt cutlets/ Quark: compared to the recipe without Protein Flakes. Our Protein Flakes are the perfect basis for mueslis. Lightly roasted, they make a great topping for salads or vegetables. These Protein Flakes also make for a creamy addition to casseroles and soups. We have collected some of our favourite Protein Flakes recipes for you here. Add some extra protein to your favourite dish. Wash the drumsticks in fresh water and pat dry. Mix together the spices, herbs and mustard and rub the mix into the meat. Cover and leave in a cool place for 1 hour. Arrange your 3-step crumbing assembly line (one dish for each) 1. Flour. 2. Egg and cream. 3. Protein Flakes as breadcrumbs. First coat the drumsticks in flour, then dip them into the egg-cream mixture and finally coat them with the Protein Flakes and breadcrumb mixture, pressing the crumbs firmly into the chicken. Heat the oil and deep-fry the drumsticks until golden-brown. Purée the chickpeas, Protein Flakes, onion, garlic and parsley with the spices. Heat the oil over a high heat and deep-fry the falafels for 1-2 mins until they are crispy and golden-brown. Place the falafels on a paper towel to drain and leave for a few minutes. Press the falafels firmly with your hands when you are forming the balls. This helps them hold their shape better during frying You can also use a little bit of spelt flour. Deep-frying isn't for you? 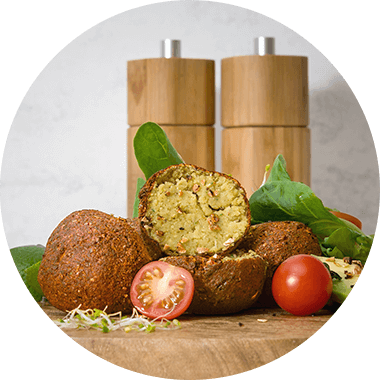 You can also place these falafels on a baking sheet, brush them lightly with oil and bake them in an oven preheated to 180°C for around 10-15 mins, until they are golden brown. Finely dice the onion and glaze them in some butter. Add the Protein Flakes and pour in the vegetable stock. Leave to simmer over a low heat for 15 mins. Let the mixture cool completely! Season with salt and pepper, mix in the finely chopped parsley. Form into burger patties and fry on both sides in a little oil until golden brown. 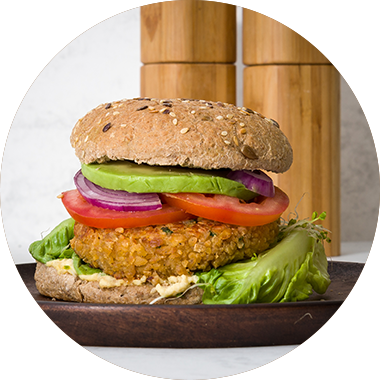 You can eat your protein burger with whatever you like: Avocado, mustard, salad, tomato... and when you are forming the patties, make sure you press the mixture firmly between your hands. You can also add a bit of spelt flour, to help the patties hold together during frying. 113 kcal, 16.2 g protein, 5.7 g carbohydrates, 1.2 g fat. Place the quark into a bowl and garnish with berries. Toast the Protein Flakes with some coconut oil in a frying pan until golden brown. Sprinkle the flakes over the quark and berries and serve. Want some extra crunch? 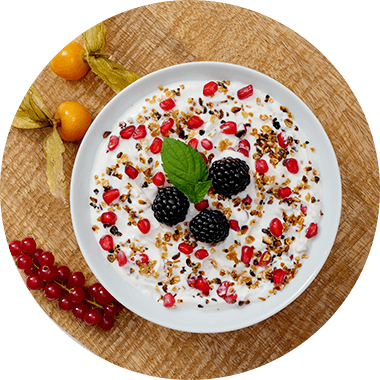 Try out our Nuts and Berries or Crunchy Fruits together with your quark. Are Protein Flakes suitable for weight loss? Who should use Protein Flakes? foodspring Protein Flakes are sourced from organic soy beans farmed in Germany and Austria. The soy for our Protein Flakes is grown exclusively on a family-run farm in the Lake Constance region and in the Burgenland region of Austria. They are then processed into our ultra fine Protein Flakes. The climate and the very rich soil in the growing regions provide the ideal conditions for organic soy. On the family farm, every step in the production process is strictly controlled, from the seed to the finished protein flakes. That is how we can ensure that our organic Protein Flakes always have the highest quality. Chemical fertilisers and pesticides are not used. Thanks to our careful processing methods, our Protein Flakes have an especially high protein content, but also around 80% less fat. And what about the hormones in soy? There actually aren't any. Soy contains naturally occurring phytoestrogens. Contrary to popular belief, these are not hormones as such, but secondary phytochemicals that are similar in structure to the female hormone oestradiol 17ß, a type of oestrogen. There is no conclusive scientific evidence that a moderate consumption of soy has any impact on hormone levels. We are aware of these concerns and have come up with a great solution: As a precaution, we use a patented process to reduce the phytoestrogen content of our Protein Flakes by up to 90%. foodspring Protein Flakes enrich your meals with an extra portion of protein. Proteins help you to increase and maintain muscle mass. A varied and balanced diet and a healthy lifestyle are also important. This high-quality plant protein supports muscle building and helps you to maintain existing muscle mass . Our fine flake soy has a high fibre content, which helps you to feel fuller after your meals. Food cravings are a thing of the past. Protein Flakes are a versatile addition for sweet and savoury dishes. 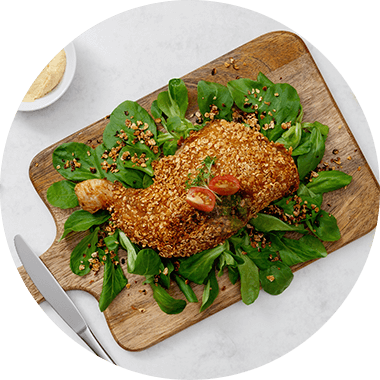 As an extra protein source in smoothies, as roasted flakes sprinkled over a salad, as a filling addition to yoghurt or quark, or even as a breadcrumb coating for schnitzel or chicken – the only limit is your imagination! How much of our Protein Flakes you will need to use and how to prepare them in the best way, will vary from recipe to recipe. In yoghurt, quark and as a topping, the amount you use is up to you. In order to successfully lose weight, it is essential to consume fewer calories than you use every day. This is what is known as a calorie deficit. Our Protein Flakes have a high fibre content, which helps to keep you feeling fuller for longer. You will feel less cravings and be less inclined to snack between meals. 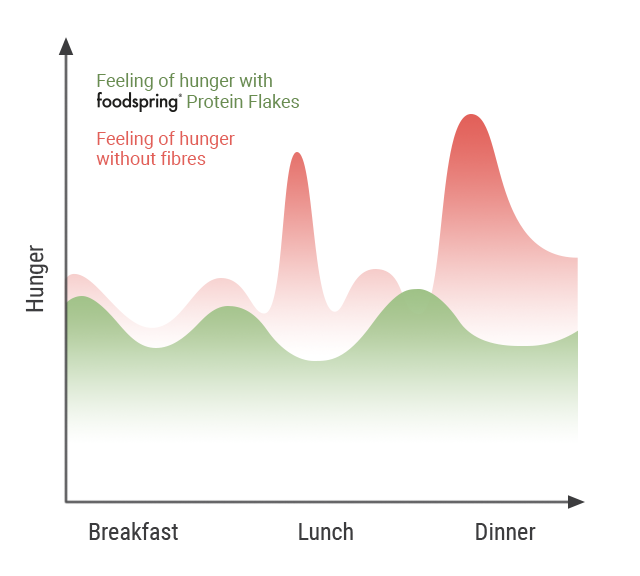 Snacking in particular can often result in consuming up to 500 kcal extra per day. When you are trying to lose weight, it is very important to eat enough protein, so that you can maintain your muscle mass. After all: if you lose muscle mass, you won't look slim and toned – just skinny. Our Protein Flakes can help you to reach your daily protein requirements. foodspring Protein Flakes support good fitness as part of a balanced diet. This makes them ideal for when you want to build muscle or lose a few kilos. Since soy protein is a very high quality protein, our Protein Flakes are also great for a balanced protein supply from a variety of different sources. Most Protein Flakes are based on soy flakes. But the source of the soy is often unclear. Genetic engineering is banned in the EU. It makes sense to ensure that the soy you are consuming is sustainable, that no rainforest was destroyed for its production and that you are getting a product that hasn’t been transported half way around the world. An organic label is also your guarantee of responsible processing and high quality. foodspring Protein Flakes are sourced exclusively from soy grown in the Lake Constance region and Austria. The family farm where our soy is grown, is one of the pioneers of German organic soy cultivation. What's more, conventional soy flakes are often very fatty and high in phytoestrogens. 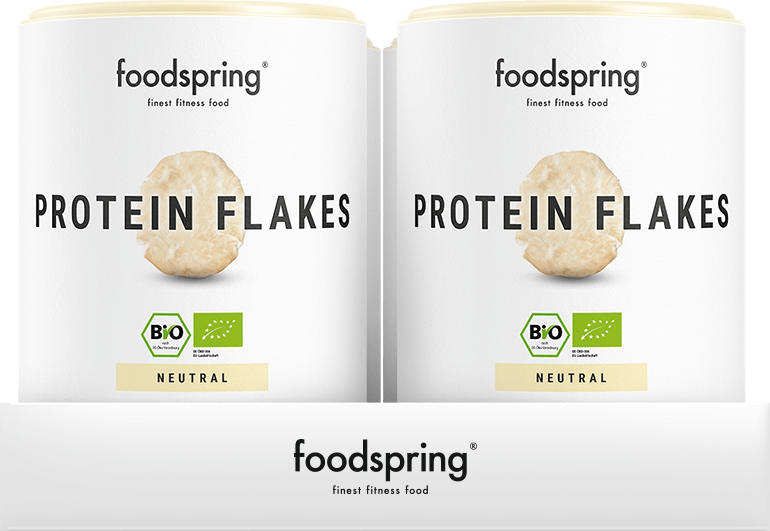 foodspring Protein Flakes are processed using a patented method and have 90% less phytoestrogen and 80% less fat. How are porridge, muesli and flakes different? Have you every tried comparing apples and oranges? Exactly. You can’t. Sure, you will find our Protein Flakes into our porridges and mueslis as well. The Protein Flakes in our porridge and muesli bring together all the other ingredients, making them wonderfully creamy and perfect. And on their own? These flakes will add the ultimate protein kick to anything you like to eat. Can I eat the flakes straight out of the pack? You can. But would you eat oatmeal straight out of the pack? It tastes a bit boring. We recommend that you add Protein Flakes to your favourite dishes. That is easier than it sounds. Simply stir them in at the end of the cooking time. Or you could add them to a shake. Stir them into muesli. Or crumb your fillet with flakes instead of breadcrumbs. You can find our recipe ideas in the recommended use tab. What are the advantages of a high fibre content? Our Protein Flakes have a whole 21 g of fibre per 100 g of flakes. Fibre is essential, because it makes your meals more satisfying and also keeps you feeling full for longer. Many foods, for example refined grain products, are highly processed and have a low fibre content. That is why you get hungry again so soon after eating. Our Protein Flakes are the perfect defence against cravings. Will soy upset my hormone levels? Soy contains naturally occurring phytoestrogens. Contrary to popular belief, these are not hormones as such, but secondary phytochemicals that are similar in structure to the female hormone estradiol 17ß, a form of oestrogen. There is no conclusive scientific evidence that a moderate consumption of soy has any impact on hormone levels. But we have still taken the precaution of naturally processing the soy flakes used for our Protein Flakes, so that the phytoestrogen content is reduced by 90%. Better safe than sorry, we say. And do these Protein Flakes add protein to every meal? The answer is obvious: Yes! And if you want to try something new or make your favourite dish a little bit better, then you can find our favourite recipes for Protein Flakes in the recommended use tab. Why are Protein Flakes more expensive than oat or soy flakes? In contrast to other manufacturers, we source our soy exclusively from a certified organic family farm in the Lake Constance region. That means that we can trace our soy every step of the way, and guarantee its origins 100%. Our Protein Flakes are very carefully defatted, so that they have a pleasantly mild flavour. And their high protein content is unaffected. Protein Flakes 4-pack will be back in stock shortly.